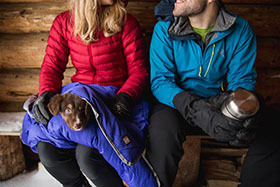 You and your pup can cozy up to Ruffwear 's Clear Lake Blanket when it's time for a break. 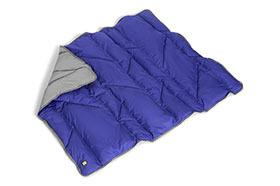 At home, in the car, or at camp, this durable insulated blanket is the go to snuggle area. Made with bluesign®-approved water- and abrasion-resistant polyester shell fabric and lofty recycled polyester insulation. A stuff sack is included for easy storage. One Size - 43" x 55"
Wash in cold water on the gentle cycle. using a mild detergent. Tumble dry low.